Today I have a gorgeous polish from Polishaus to share, no introduction needed. Let’s get into it. This is Sofia, a magenta that leans a little purple. It has orange shimmery flakes in it, it’s so rich and vibrant love this one! It has a little bit of a thick formula but that didn’t really affect polish application, it still applied nicely. I used 2 coats, but if you applied more carefully than I did lol you could get away with 1 coat. 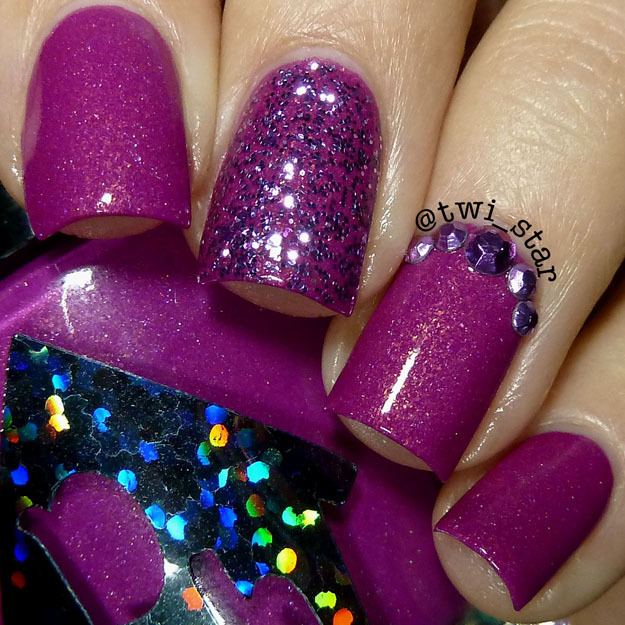 For the glitter accent nail I used LA Splash Lavish Lavender, it’s a clear base with purple and pink glitters. I applied one coat. On the ring finger I applied purple jewels that I got from ebay. So glad I picked up this polish and a couple others from Polishaus, they’re beautiful! Thanks for stopping by!